Who Knew? I mean let’s be honest here, who knew that Missoni would be as much of a hit that it has been, as of today. 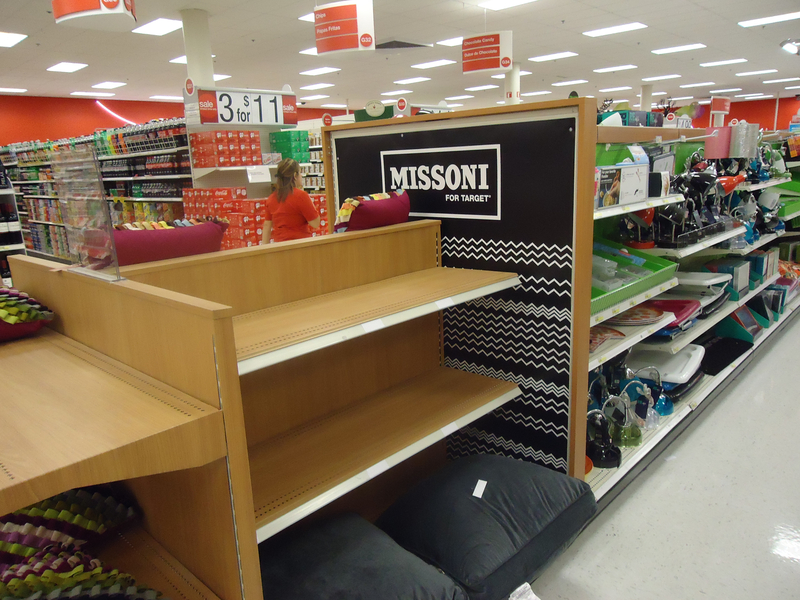 Target today launched the Missoni For Target line, the biggest in the retailer’s history. Consisting of 400 pieces, clearly it was going to cause much buzz, but hustle and bustle, was not foreseen. Sure, this brand is among the most iconic, and in my mind I was sure that the Target Collection would be a smash, however I though it would be a smash for the ones who know, “The Ones Who Know”, has been a phrase in fashion that is used when speaking of Labels in which are so exclusive, there usually only known to the small circle of who are invited know. 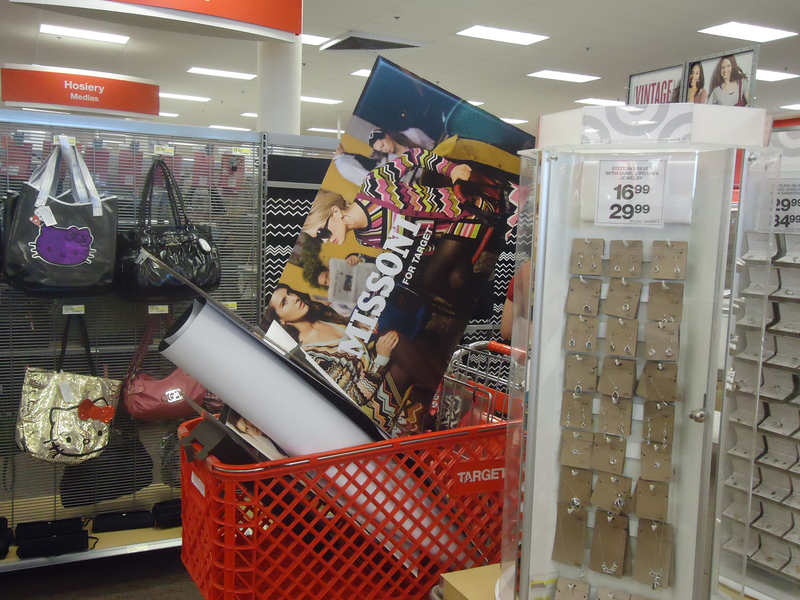 Clearly All of America knew who Missoni was, and especially knew about the Target collection. I had already made up my mind that I would wait till mid morning ,or in my terms “noon”, to go take a look. To be completely honest, The idea that the Missoni collection would sell the way it did on its Launch was really something I did not see coming. When I awoke this morning to my news Feed on twitter and Facebook both blowing up, in fact the #1 trending topic on twitter was #MissoniforTargt. I thought to myself, could this be, could people all over USA really be this excited about the collection, again to be honest I really only thought it was myself who was feeling the overwhelming amount of elation over this. Noon rolled around, I through on my cap, grabbed one of my infamous black t-shirts and headed to the Target at Medallion Station, which is a much smaller Target. I figured let me start there, no one would clearly go to the small one in search of Missoni given that the Super Target is right down the street from this mini store. Well my Missoni Mission clearly became Mission Impossible. I walked in, and the somber silence was for sure changing my energy, I told myself, I’m so Tardy for the Party! For being the supermarket that Target is, I thought were the hell is every one, this Target was left High and Dry, and it was ,TIRED! As I walked over to the make shift Missoni Section, I see all but six or so garments left on the rack, and a group of those Ultra Chic, basket pushing, Pump wearing Moms,( always fancied their ability to look this fab while shopping for Silk Milk), shuffling though what was left, and their questions of ,Where is its and where are theys ,to the Target Sales Team. It looked as if it was leaving those associates cornered in a fashion jungle with the Amazon Moms reaching for their machetes. It was clearly time to leave, and wait for the next shipment. I approached one associate, as she filled the empty racks with Massimo product, which seemed to have been fooling some costumers, again “for those who know”. I said Ma’am?, she turns and said, “If you’re looking for Missoni we are out till next shipment, and i don’t know when that is”, then turns and goes back to her business. I laughed and told her, “I take its been crazy”, she replied with “YES”, with a DUH undertone. She then went on to explain the morning, This small Target, hidden away in a small shopping center had a line of 200 plus people, all waiting frantically for a chance at Missoni Chic. In fact, the store opened its doors at 8am, and Missoni sold out by 8:15am. The sales Associate stated, “it was worse than black friday”, and then asked “what the hell is Missoni?”. So of course I explain the Italian Fashion House’s History to her, she then elaborated on her plan to snag some of the merchandise in next week’s shipment, I left this conversation with the feeling that I may have created yet another Missoni Monster. 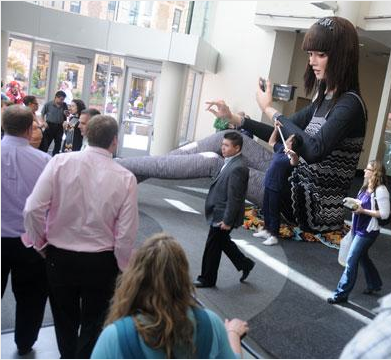 This day sure is interesting ,in buying behavior, A Target in Missouri, in fact Target’s flagship store, erected a large Doll/Mannequin named “Little Marina” to help attract traffic, clearly this wasnt needed but it adds to the hype. Little Marina now has a twitter of her very own , and shares fashion tweets of her Missoni Life, to me Marina is no better than the over sized snow men on the side of a freeway, telling you to EXIT NOW at a christmas tree ranch, at least Marina is in Missoni head to toe! The Missoni Bike is the big “TARGET” for all shoppers, we maybe seeing this holiday season’s “it” gift, although the exclusivity of Missoni product is powered by this $400 chevron Bike, some stores only have three in stock, the Target at medallion station is limited in one bike, The first person that made through the doors this morning was the person who was able to request the purchase. All this madness leads me to think, even though we have weeks before the official holiday shopping season kicks off, Today’s Launch maybe marking the holiday shopping Pre-season, it has become sport after all. Who knows maybe missoni will extend their visit at Target, I would enjoy a chevron knit stocking, that for sure.! This entry was posted in | and tagged DALLAS, DFW, HOT MOMS, Little Marina, Missoni, MIssoni for Target, Super Market, Target. Bookmark the permalink. I am cracking up at your post. I worked at a charity golf tournament for a client all day yesterday, so I had to pass on the Target Trek made by Lisa Petty and Abby Gregory today. Apparently, they had luck at a secret location. You can read all about it at DFWStyleDaily tomorrow. So sad, I missed out. But at the same time, I’m not big on wearing stuff that a million other people have. This is true!! !, same reason why don’t shop IKEA! Actually happy I skipped the madness, but I do have my eye on the Missoni for Target coffee set!